← Condo Associations Million Dollar Windfall! Hiking in Southwest Florida! Who Knew?! 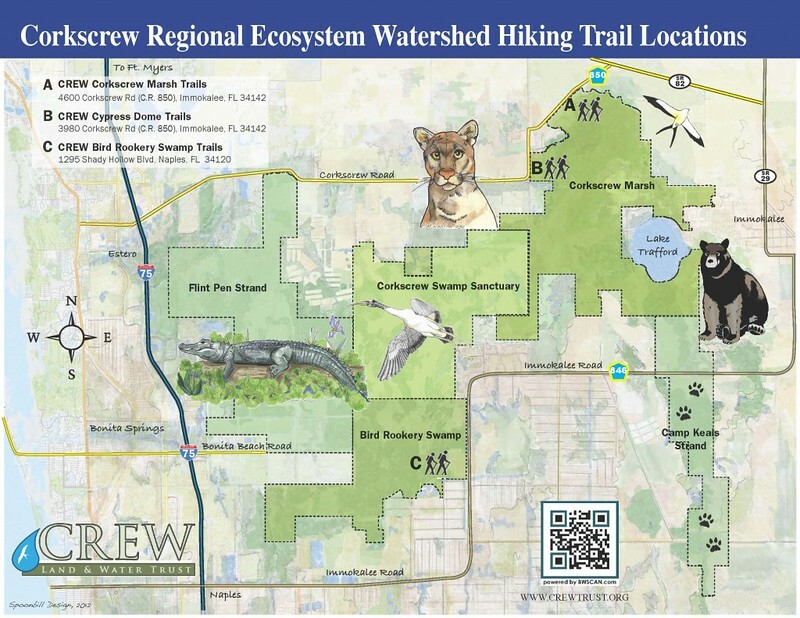 The CREW Trust has worked diligently with the South Florida Water Management District and the Florida Fish and Wildlife Conservation Commission to ensure public access and recreation opportunities on these public lands we call CREW. There are exceptional recreational opportunities for people of all ages on nearly 30 miles of hiking trails, with more planned in the future. The CREW Marsh Hiking Trails (also known as Gate 1) offer 5.5 miles of marked loop trails through pine flatwoods, oak hammocks, along the edge of a sawgrass marsh, and through a popash slough (pronounced sloo). Trails are flat grass/sand ground level. Trail maps are located at the trailhead. One port-a-potty is available at the trailhead. No buildings or running water. No trash cans. Observation deck and tower, two boardwalks, benches along trails, picnic tables located 0.7 miles from trailhead. From Naples/Bonita Springs/S. Fort Myers: Travel I-75 N to exit 123 (Corkscrew Rd.). Go 18 miles east on Corkscrew Rd. You will pass the CREW Cypress Dome Trails. Go another 4 miles and you will see the CREW Marsh Trails on your right. Look for the brown road signs. Posted on August 29, 2013, in Real Estate and tagged Bonita Springs Realtor, Cape Coral Realtor, Corkscrew Regional Ecosystem Watershed Hiking Trails, Corkscrew Road, CREW Marsh Trail, Estero Realtor, Florida Fish & Wildlife Conservation Commission, Fort Myers Realtor, Hiking in Southwest Florida, Kristen Pell, Property Guiding, Real Estate Biz, South Florida Water Management District, SWFL Real Estate, The CREW Trust. Bookmark the permalink. Leave a comment.